The legal minimum wage in Colombia is 781,492 COP, equivalent to 280 USD, approximately 3,255 pesos or $ 1.17 per hour. As of January 2018, there were 2.6 million unemployed Colombians, corresponding to 11.8% on the total base, 0.3 points higher than in 2017. Additionally, the underemployment rate was reduced from 32.5% to 30.6% and the number of people with informal work is around 6.9 million. In 2017, Colombia ranked as one of the four countries with the highest unemployment in the region, according to the International Labor Organization (ILO). For the displaced population, the chances of getting a stable job are laughable and if they succeed, maintaining it is very difficult. The internally displaced have forcibly left their homes in search of protection from persecution or danger, without crossing an international border. In 2016, Colombia was the first on the list with the most internally displaced persons, with a total of 6.9 million cases, according to the UNHCR. 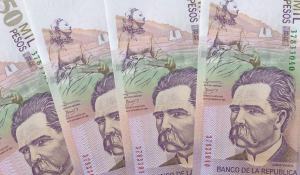 50,000 Colombian Pesos = Approximately $17 U.S. It is estimated that there are approximately 500,000 displaced people in Bogotá. ​Currently, there are 7.9 million registered victims of forced displacement and dispossession, in the Unified Registry of Victims.